This entry was posted on Sunday, August 19th, 2018 at 8:23 am and is filed under Weather. You can follow any responses to this entry through the RSS 2.0 feed. Both comments and pings are currently closed. right now it’s 72 degrees in sandy, oregon. according to the NWS Portland office discussion page the cooler air and a chance of rain for oregon, mainly that chance of a wetting rain for the higher terrain, i.e., cascades. Other than that, light rain and drizzle for the coast and coastal range. 18Z GFS came out being much wetter. It will be interesting to see if the EURO does the same thing. 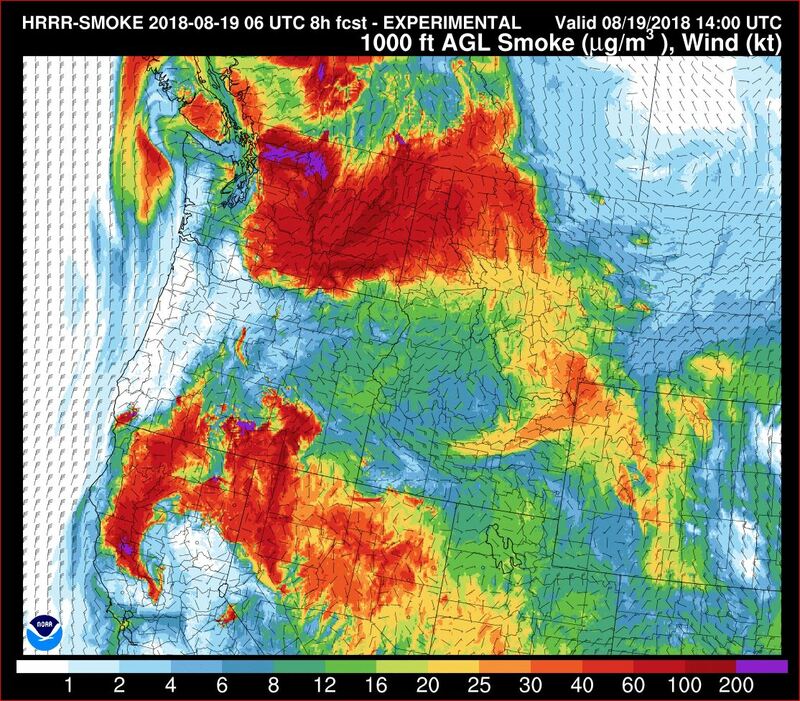 This would be in the right direction (at least for me) to help with the fires around the PNW. It’s definitely not going to reach 90 today in PDX. Marine air moved in overnight, which cooled us off and raised the humidity, plus the smoke is thicker overhead than it’s been all Summer so far. The combined effect is going to keep us down into the mid 80s, at the warmest. Current temperatures around PDX (KPDX doesn’t seem to be reporting for some reason) are all in the mid to upper 70s at 2pm, with only a handful of low 80s sprinkled in. Air quality improved to moderate this morning, but is now back to unhealthy levels. Visibility is down to maybe 1.5 miles here right now. Even worse east of the mountains; Spokane and Tri-Cities are reporting hazardous air quality this afternoon. 71 At 1:30 pm here in Albany. Probably a bust for high temps today. 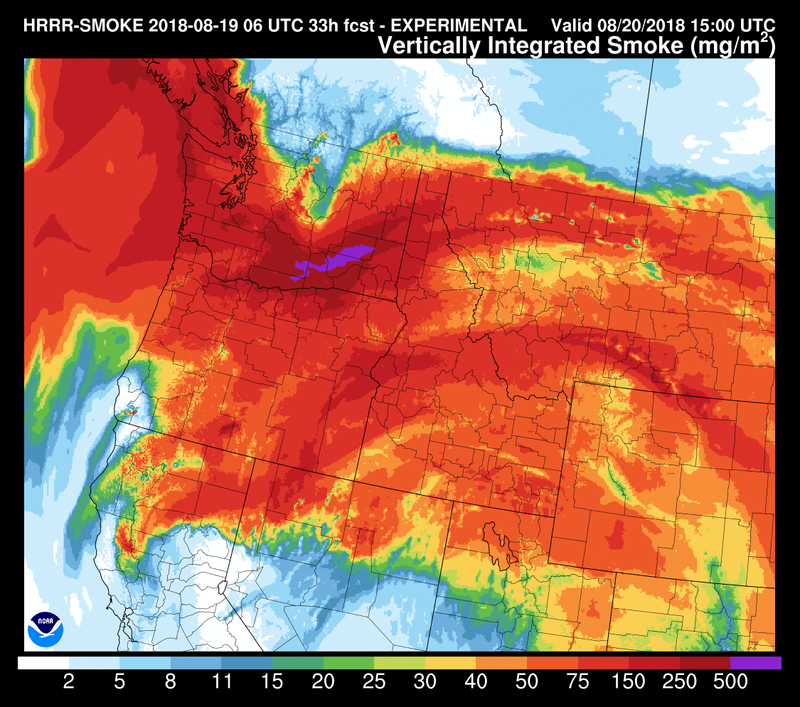 maybe the smoke will save Portland from breaking the number of 90s for summer? “Taste of Fall”? More like “Taste of Normal”. 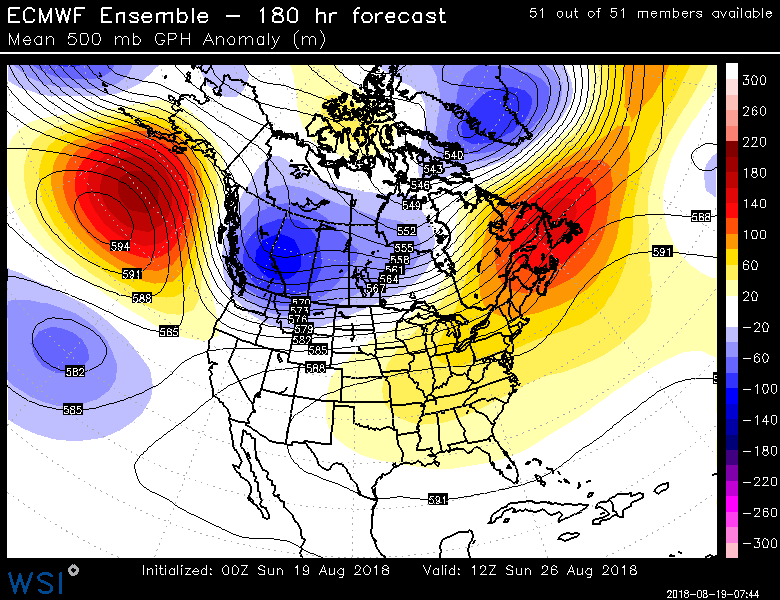 Upcoming highs look to be just a few degrees below normal summer temps. Don’t think we’re hitting 90 today. No complaints here. Thanks for something, smoke. Was just thinking the same thing. PDX is six degrees cooler than yesterday at 1pm. Red sun here this morning- and it feels like early fall. The temperature here in BC has dropped because of the thick smoke. It’s time to PUT A FORK in summer! Yeah, not pleasant up here in the West Hills. Air quality is tumbling down a ravine right now. It’s not the greatest out my way either. I have to use my inhaler. Normally I don’t need to use it but this year I have needed to use it a few times because of the smoke. “K” not sure what models you look at but I have been looking at Windy.com. I zoom out and I have been looking at the temperatures up North (Alaska and Canada area) I have been noticing the temps have been steadily dropping. I noticed over on Greenland there are temps below zero. Could fall start sooner this year??? I don’t know but I said something about what I think could be happening for fall/winter. We’ll see if what I said comes true or not. I’m doing great Ken, how are you? My sincere hope is that fall gets an early start. 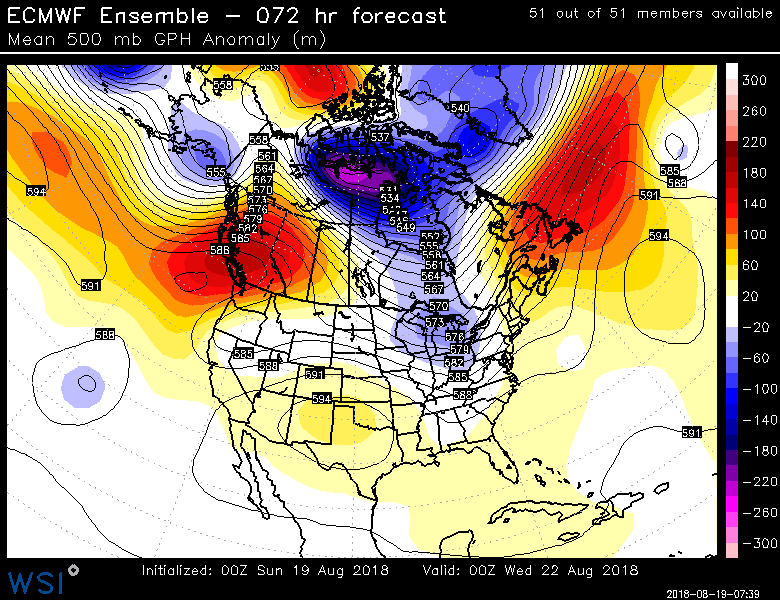 I have been chatting on the Category 6 weather forum, and some there have mentioned the possibility of an active typhoon season, which bodes the possibility of a typhoon riding the jet stream straight into us. Sadly, the GFS has removed the somewhat hefty rain we were supposed to get, but it’s still a while out so a lot could change. I’m doing great K. I ordered a new laptop (a gaming laptop with more RAM and a higher processer) because my current laptop is falling apart. Watch out for smokey sub-90 shockers the next few days! I would love it if every day in July and August was like a 90 degree September day. 50 or below each morning, 90 by 2pm and a quick cool down again. Anyone else? Definitely like the 50 degree mornings, but 90 is too much for me. 80 is tolerable, 70 is preferable. You mean the way it used to be? 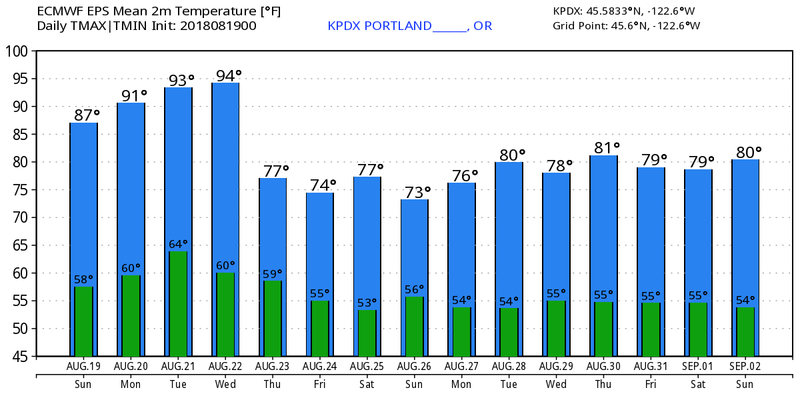 Lows above 60 were a rare thing in Portland until the last several years. We’ve had 15 lows at 60 or above this month. That’s insane! I agree, I do remember much cooler nights. I probably missed previous comments–as I am in a rush this evening; but it “appears” that PDX should “tie” the 90’+ record on Monday @ 29 days; then “beat” it @ 30 and 31 days respectively this Tues. and Wed.! Took a day trip out to Central Oregon today, showing off the area to my neighbor and his kids (they moved here from Oklahoma a couple of years ago) who had never been out there before. Turned them all loose with rock picks to dig up thundereggs on Richardson’s Ranch NE of Madras. They absolutely loved the Oregon Desert, and we dug up some really nice geodes. The air was pretty clear this morning, but as the afternoon wore on the smoke rolled in really thick. Visibility dropped from maybe 30 miles (still not great) down to less that 5 by the time we left. I might be selfish here (knowing the smoke and flames are out there) I live in Sandy. But the part of “fall” I do not like (on the west side) is moonscape, constant drizzle, rain, or light rain. At least in Central Oregon it may rain, but it gets it over with. No moonscape or constant drizzle or rain/heavy rain. You get to enjoy cooler temps, of course, for fall, but you enjoy crisp air, falling leaves and don’t have to plan anything around the rain. But Jesus has my sister and I (caregiver) planted in Sandy. For now. So anyone placing bets on whether this does a 180 again? How is this any different when it comes to the forecast? I actually thought the same thing but the models keep showing it. About a week ago I said something about this week could be the turning point with not having the extreme heat. It looks like later in the week that could come true. This is the way I look at it. I want to say the seasons are a little off. We started getting drier and warmer early (like spring and summer started early) so I believe fall will start early. I don’t think we will see a bunch of rain but we could start seeing temps a little below average. I could be eating crow but I have been watching how the whole year has been transpiring and this is what I believe. My thoughts exactly… there was supposed to be such a change underway a week or two ago and it went bust. Here’s hoping this one turns out to be the real thing. As soon as the air gets nasty and smoky I start getting tired of summer! No more thunderstorms early this week? Glad to see relief is finally on the way! We’re getting a nice taste of fall here in Rapid City this morning, too. Rainy, windy, and barely 60 degrees. Summer is winding down for sure. I wish summer would never leave. One more round of hot weather? You sure? It would be nice to be done with the 90’s and drop into the 70’s for more than one day! !